The grammatical guru behind the #1 international bestseller Eats, Shoots and Leaves visits with her new novel, a humorous tale of cats, mystery, and murder. For people who both love and hate cats comes the tale of Dr. "Wiggy" Winterton, a librarian who finds himself suddenly alone: he's just lost his job, his beloved wife has just died, and to top it all off, his sister has disappeared. Overcome by grief, he stands in his sister's kitchen staring at the only witness to what's happened to her—her cat, Roger. Who then speaks to him. It takes a while for Wiggy to realize he's not gone mad from grief, that the cat is actually speaking . . . and that much of what we fear about cats is true. They do think they're smarter than humans, for one thing, and, well, it seems they are! What's more, they do have nine lives. Or at least this one does: Roger's older than Methuselah, and his unblinking stare comes from the fact that he's seen it all. And he's got a tale to tell, a tale of shocking local history and dark forces that may link not only the death of Wiggy's wife, but also several other local deaths, as well as the disappearance of his sister. But will the cat help Wiggy, or is he one of the dark forces? 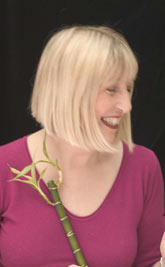 ABOUT THE AUTHOR Lynne Truss is the author of the New York Times bestseller Talk to the Hand, and The Lynne Truss Treasury, and Eats, Shoots & Leaves, for which she won Britainas Book of the Year Award and has sold over three million copies worldwide. Truss is a regular host on BBC Radio 4, a Times (London) columnist, and the author of numerous radio comedy dramas. The author of the famous book on punctuation, Eats, Shoots & Leaves, Lynne Truss gives us a sensational new mystery, Cat Out of Hell. Truss herself says, “It concerns the mystery of a missing woman, a talking cat called Roger, a remote seaside cottage, and a nice retired librarian with a dog called Watson.” The Times calls Cat Out of Hell, “Not unlike Sherlock Holmes solving The Master and Margarita with the help of Jeeves.” Truss has written several books on punctuation, Tennyson, cats, and one book on her obsession with sport called Get Her Off the Pitch. She lives in England. Bill Bryson; Lynne Truss, Get Her Off the Pitch! : How Sport Took Over My Life. Midsummer Nights - Kate Atkinson, Lynne Truss and Jeanette Winterson. Kate Atkinson, When Will There Be Good News?. ; Lynne Truss, Eats, Shoots & Leaves: Why, Commas Really Do Make a Difference!. ; Jeanette Winterson, Oranges Are Not the Only Fruit. Tickets £10. "Diana Athill and Katherine Whitehorn. Lynne Truss's book That's Not English: Britishisms, Americanisms, and What Our English Says About Us was available from LibraryThing Early Reviewers. Lynne Truss is currently considered a "single author." If one or more works are by a distinct, homonymous authors, go ahead and split the author. Lynne Truss is composed of 6 names. You can examine and separate out names.